Food sensitivity was responsible for my Arthritis! I suffered from severe joint pains: in the lower back, upper back, both sides of the hips, sciatic pain going down to the ankle on the right side, more excruciating for the last 15 years. The pain used to get very bad on certain days, especially during cloudy and rainy days. During those days I could not do many of my chores. I had to stay in bed for a couple of days with pain pills and the local application of liniments or heating pads whenever I had an attack of arthritis. I had these severe attacks of pain at least once a week. Most other days even though I was mobile I still suffered from constant nagging dull pain on my back, neck, and hip all the time. It was severe only on certain days. I had tried many prescription medicines with no positive results. I found Dr. Devi six years ago. I was treated twice a week for almost six months. After I got treated by Dr. Devi for basic allergies, amalgam (dental fillings), and my gold and silver jewelry, my arthritic pain completely left me. I have not had another attack in the past six years. I never knew I had allergies before I came to Dr. Devi. When she told me that I was allergic to all the foods I was eating, I did not believe her. Now after having been treated for most of the food items, I believe that food allergy was the cause of my arthritis. Thank you, Dr. Devi, for helping me enjoy my life again! A large section of the UAE population suffers from Rheumatoid Arthritis, a disease that swells up the joints and causes pain, but there was a huge delay in diagnosis of the disease. Reason? The affliction has varying symptoms, including fatigue which could deflect attention to other illnesses. Arthritis affects 20 percent of the UAE population but only 6000 people have been officially diagnosed, according to the Foundation, which is a brain-child of Dr. Badsha. It warns that Rheumatoid Arthritis can reduce life expectancy by 3 to 18 years. “Within 20 years of diagnosis, 90 percent of sufferers will be disabled,” it says. Arthritis is a term often used to mean any disorder that affects joints. Symptoms generally include joint pain and stiffness. Other symptoms may include redness, warmth, swelling, and decreased range of motion of the affected joints. Other types include gout, lupus, fibromyalgia, and septic arthritis. Rheumatoid arthritis is an autoimmune disorder that often affects the hands and feet. Rheumatic conditions are typically characterized by pain, aching, stiffness and swelling in and around one or more joints. The symptoms can develop gradually or suddenly. Certain rheumatic conditions can also involve the immune system and various internal organs of the body. An earlier and accurate diagnosis can help to prevent irreversible damage and disability. 31% (8.3 million) of working-age adults with arthritis report limitations in work. Impairment in the ability of people with arthritis to perform essential daily tasks may interfere with their work, their sense of purpose in their community, or the care they can provide for their family. Just as the causes of different types of arthritis can vary widely, the pattern and location of symptoms of arthritis can also vary depending on the type. Difficulty moving a joint. Moving a joint or getting up from a chair should not be hard or painful and can indicate arthritis or other joint problem. Most types of arthritis are caused by a combination of many factors working together, although some arthritis conditions have no obvious cause and appear to be unpredictable in their emergence. Some people may be more susceptible to certain arthritic conditions due to their genetic makeup. Additional factors, such as previous injury, infection, smoking and physically demanding occupations, can interact with a person’s genes to further increase the risk of arthritis. 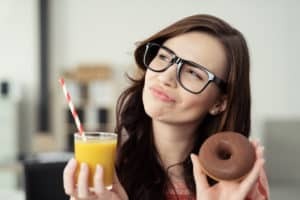 Diet and nutrition can play a role in managing arthritis and the risk of arthritis, Foods that increase inflammation, particularly animal-derived foods and diets high in refined sugar, can exacerbate arthritis. Similarly, eating foods that provoke an immune system response can exacerbate arthritis symptoms. Gout is one type of arthritis that is closely linked to diet as it is caused by elevated levels of uric acid, which can be a result of a diet high in purines. As such, diets that contain high-purine foods, such as seafood, red wine and meats can trigger a gout flare-up. Vegetables and other plant foods that contain high levels of purines do not appear to exacerbate gout symptoms, however. Cartilage is a flexible, connective tissue in joints that absorb the pressure and shock created from movement like running and walking. It also protects the joints and allows for smooth movement. 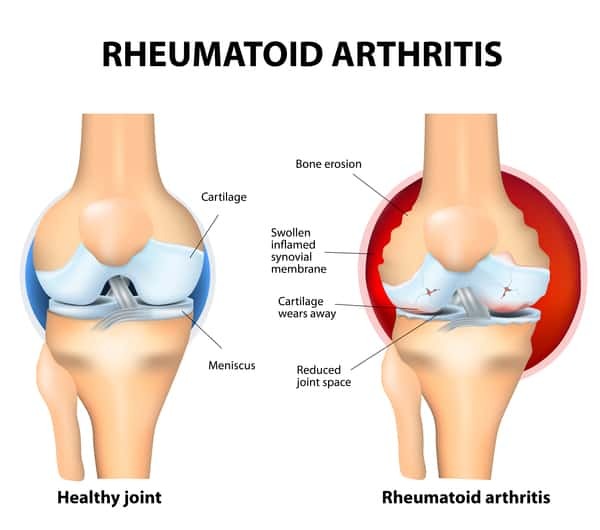 Rheumatoid arthritis occurs when the body’s immune system attacks the tissues of the body, specifically connective tissue, leading to joint inflammation and pain and degeneration of the joint tissue. When you think of arthritis, you think of inflammation. Inflammation is a process in which the body’s white blood cells and immune proteins help protect us from infection and foreign substances such as bacteria and viruses. In some diseases, however, the body’s defense system (immune system) triggers an inflammatory response when there are no foreign substances to fight off. In these diseases, called autoimmune diseases, the body’s normally protective immune system causes damage to its own tissues. The body responds as if normal tissues are infected or somehow abnormal. What Is Degenerative or mechanical arthritis? Degenerative arthritis: A type of arthritis caused by inflammation, breakdown, and eventual loss of the cartilage of the joints. Degenerative arthritis is the most common form of arthritis, usually affecting the hands, feet, spine, and large weight-bearing joints, such as the hips and knees. Also known as osteoarthritis and degenerative joint disease. What Is Soft tissue musculoskeletal pain? Musculoskelet al pain affects the bones, muscles, ligaments, tendons, and nerves. It can be acute (having a rapid onset with severe symptoms) or chronic (long-lasting). Musculoskeletal pain can be localized in one area, or widespread. Lower back pain is the most common type of musculoskeletal pain. Other common types include tendinitis, myalgia (muscle pain), and stress fractures. Back pain can arise from the muscles, discs, nerves, ligaments, bones or joints. Back pain may even be caused by problems with organs inside the body and can be a result of referred pain, i.e. a problem elsewhere in the body that causes a sensation of pain in the back. Back pain may have a specific cause, such as osteoarthritis – often called spondylosis when it occurs in the spine – which may be visible on diagnostic imaging or physical examination. A “slipped” disc is another cause of back pain, as is osteoporosis (thinning of the bones). In most cases it is not possible for a doctor to identify the exact cause of back pain – this is often described as “non-specific” pain. Connective tissues are tissues that support, bind together or separate other body tissues and organs. They include tendons, ligaments, and cartilage. Joint pain is a symptom of CTD, but the inflammation that characterizes CTD may also occur in other tissues including the skin, muscles, lungs, and kidneys. This can result in a diverse range of symptoms besides painful joints and require consultation with a number of different specialists. Infectious arthritis is an infection in a joint. It may also be referred to as septic arthritis. It occurs when an infection caused by a bacteria or virus spreads to a joint or the fluid surrounding the joint. This fluid is called the synovial fluid. 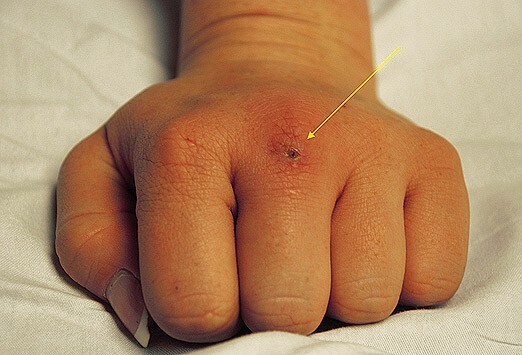 This infection usually begins in another area of the body and spreads through the bloodstream to the joint tissue. The infection may also enter the body through surgery, open wounds, or injections. Infectious arthritis usually only occurs in one joint. The condition typically affects a joint such as the knee, knuckles hip, or shoulder. It occurs more often in children, older adults, and people who use illegal drugs. 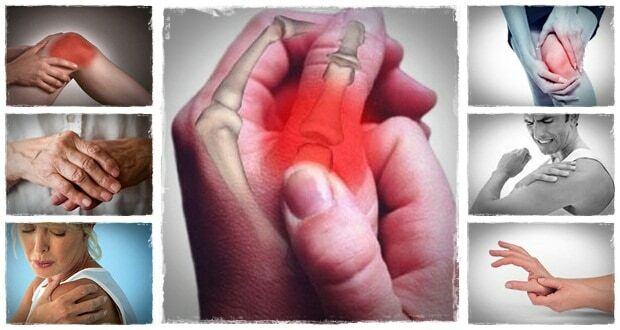 What Are the Symptoms of Infectious Arthritis? Most uric acid dissolves in blood and travels to the kidneys. From there, it passes out in the urine. Some people have elevated levels of uric acid because they either naturally produce more than is needed or their body cannot clear the uric acid quickly enough. 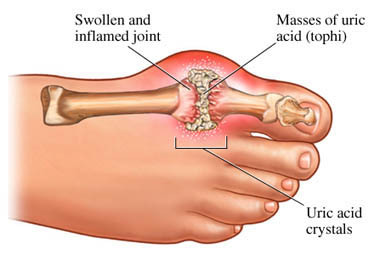 Gout can either come and go in episodes or become chronic if uric acid levels are not reduced. It commonly affects a single joint or a small number of joints, such as the big toe and hands, and usually affects the extremities. This is thought to be due in part to the increased formation of uric acid crystals in cooler joints, i.e. those not close to the main warmth of the body. Whether you have a non-inflammatory or inflammatory type of arthritis or even a painful case of gout, there are numerous medications and recommendations to relieve pain and ensure that your joints do not become damaged further. Depending on the type of arthritis, the medications that are given may be different. For example, the first-line treatment for osteoarthritis is acetaminophen (paracetamol) while for inflammatory arthritis it involves non-steroidal anti-inflammatory drugs (NSAIDs) like ibuprofen. Surgery – the joint replacement and joint surgery. NAET offers the prospect of relief to those who suffer from Pain, allergies, and Intolerance by reprogramming the brain to perfect health. 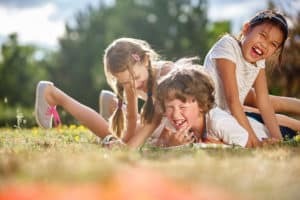 Just like rebooting a computer, we can reboot our nervous system through NAET to overcome the adverse reactions of brain and body. My Disabling Pain Was from Allergies! After I turned 21, I broke my leg in a motorcycle accident, and even though it was tough not walking for 6 weeks, what was about to happen 6 months later was even tougher. I was only 21 years old and soon after I had pains in my hand, which soon spread to my whole body. I could barely hold a grip on anything and my feet hurt when I walked even a short distance. I was suffering from arthritis and inflammation, although just months ago I was perfectly healthy. I didn’t know what to do, so I went to many different doctors in California and even to Mayo Clinic in Rochester, Minnesota. The best doctors in the world had no complete diagnosis, and all I knew was that I could barely walk and every joint in my body hurt beyond comprehension. I felt as though my life was taken from me because I had to quit my job and attend online classes because it hurt so much to walk and I had no energy to barely get up anymore. As faith led me to acupuncture and I met Joyce Remo Alo, who does acupuncture as well as NAET ®. I started with the acupuncture and NAET® treatments and felt some relief as I passed the basic ten. I had many food allergies and things that I was allergic to that I had no idea about. I was lactose intolerant which I knew but I’m now able to drink milk with no problems. I was having problems eating chicken and eggs as well as many others which I now eat with no reaction. Also as I began clearing my body of the numerous allergies, my symptoms improved. I’m now able to work at my job, attend school full time, and ride motorcycles, which is my real passion. It is nice not having pain, stiffness, and fatigue all the time. Without Dr. Nambudripad’s books and training given to Joyce Remo also I would be unable to do any of the things that I’m doing today. I Thank NAET enough for helping me find this new life! I Suffered from one of the worst types of degenerative arthritis called osteoarthritis all along with my football career. I had symptoms of arthritis before I started my football life. I played with Green Bay Packers, Cleveland Browns, Pittsburg Steelers, and L.A. Rams for 14 years. I took pain pills, had my knees aspirated and the liquid drained off occasionally. Periodically, I took cortisone shots to reduce inflammation in my knees throughout my career. I was never free of pain even with the number of different medications I took every day. The medication helped to assuage the pain. Sometimes, I got severe indigestion and abdominal cramps after taking medication. Then I was guided to Dr. Devi and divine NAET. After a few basic NAET treatments, my knees stop hurting. I was also allergic to pain medication and she treated me for my medications too. Now I can take medication if I needed it without getting any discomfort. It was a relief to find out that I didn’t have to take pills throughout the day to get me going. I continued the NAET treatments for over a year. Now my arthritic pains and indigestion are non-existent. No more cortisone injections, no more aspiration of the joints, no more draining the synovial sacs since 1996. I am not dependent on pain pills anymore. Not only that, I am blessed to eat any food without having to worry about getting indigestion or pains in my knee as long as I test for allergies before I eat them. Dr. Nambudripad has taught me how to test my allergies by using muscle response testing. It is a life-saving technique. Everyone should learn it. Occasionally I still get some allergies to the items I have not treated before. With the muscle testing knowledge in my hand, I am able to locate the offenders before they get me. Whenever I eat some allergic item I can still get some aches and pain. Since I am not allergic to the pain medication, I take them if I needed them and they work immediately. I am enjoying every moment in my present pain-free world. Health is Wealth! Health is Great! I will barter anything for this health! I can’t thank Dr. Devi and NAET enough for helping me find this new life! Surprisingly helpful specifics that you have mentioned, many thanks for submitting. Surprisingly stimulating details that you have remarked, thanks a lot for publishing. Thank you for your comment ???? We are looking forward to hearing from you on our next blogs. Please don’t forget to subscribe to our blog and you will receive mails once we published new blogs. Just want to say your article is as astonishing. The clarity in your post is simply cool and i could assume you’re an expert on this subject. Fine with your permission allow me to grab your feed to keep up to date with forthcoming post. Thanks a million and please carry on the enjoyable work.